Since his childhood Labros Pervolarakis has grown up with the cultivation of grapes. Therefore, he knows the specific climatic and geological features of the vineyards in his home village Profitis Ilias south of Heraklion (Crete) as well as he knows the history of certain locations and producers of that area. In the beginning, Labros was the head of the village’s agricultural cooperative’s pack house. In 2002 he founded his own company in order to meet the needs of the market in a more adequate and effective way, ensuring the income of dozens of farmer families. Having one of the most modern pack houses in the area, Labros’ company is among the biggest export companies of fresh produce in Crete. At the same time he is a pioneer in organic farming on the island. More than 10 years ago, together with some open-minded producers, he started to cultivate all his vineyards organically. In 2005 he joined the “Organic Marketing and Export Network” (O.M.E.N.). Today, his pack house centrally organises harvest and collection of almost all available organic table grapes of the island. The know-how, many years of experience in exports, modern chilling equipment in the quality selection area of the pack house as well as a rapid pre-cooling system, ensure the highest possible standards for customers abroad. 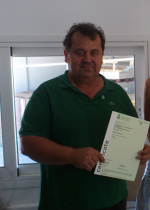 The pack house of the Labros-Giorgos S.A. is certified according to the GlobalGAP and BRC standards. Furthermore, since 2011 it is certified by the Swiss certification organisation bio.inspecta according to Biocyclic and Naturland standards and is a member of the Biocyclic Network, which is part of the Naturland Association.